Get the Last Date of an American Classic in Mint State Condition! An Icon Among Coins, More Than a Century in the Making! Every coin collection, like every collector, is extraordinarily unique. Pore over one that isn't your own and you'll discover special treasures accompanied with incredible stories (especially if the owner is nearby!). 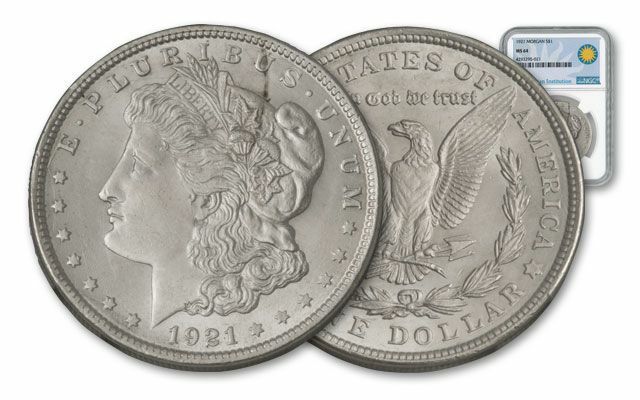 However, we wouldn't be going out on too much of a limb by saying that most collections you'll encounter will have at least one Morgan Silver Dollar. Since its premier in 1878, this numismatic favorite has commanded the attention of coin fanatics and silver stackers alike. And now, thanks to our diligent buyers, we've found a special hoard of the last of this preeminent series. Uncirculated Morgans From the 1921 Comeback Run! These gorgeous Morgan Silver Dollars, struck in 90% pure silver at the "Mother Mint" in Philadelphia, were part of a marathon mintage. 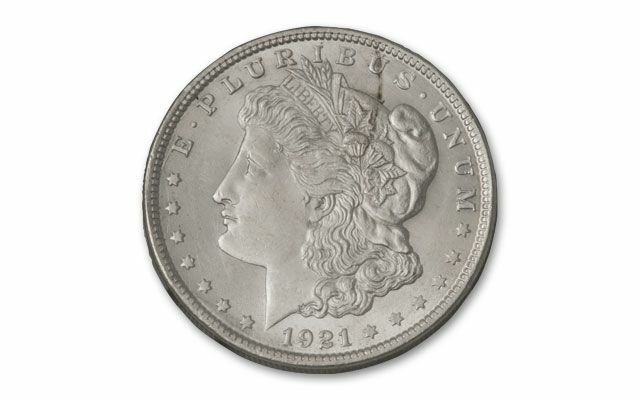 The Morgan series was put on hold in 1904 due to (now-unthinkable) low demand and an even lower supply of silver. 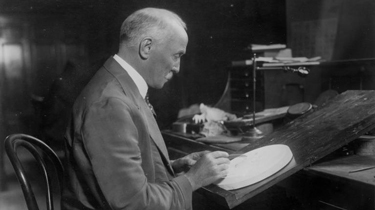 However, after the Pittman Act melted hundreds of millions of Morgans, the 1921 run hoped to put George T. Morgan's design back in pockets and safes across the country. That is, until the Peace Dollar began its run later that year! 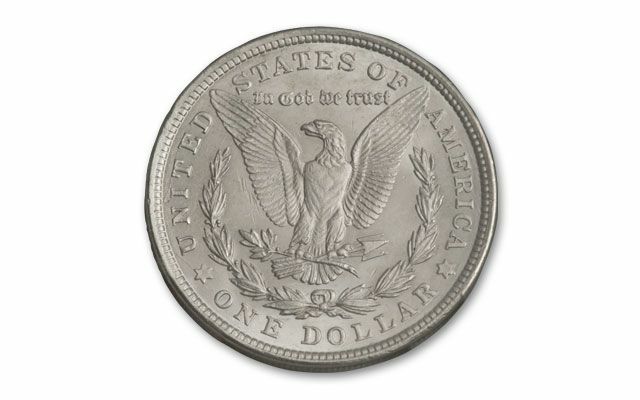 Over time, the rarity of these 1921 Morgans have proven to be the equal of many of the Morgans released from 1878 to 1904. Bring Home More Than a Morgan, Secure a Stellar Story! 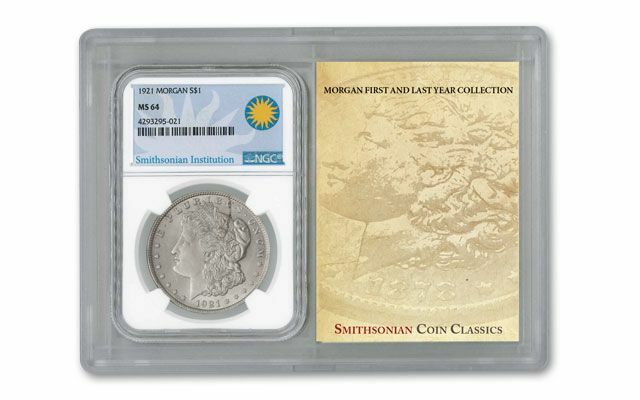 It comes as no surprise that a 1921 Morgan Silver Dollar is part of the Smithsonian Institution's numismatic collection. 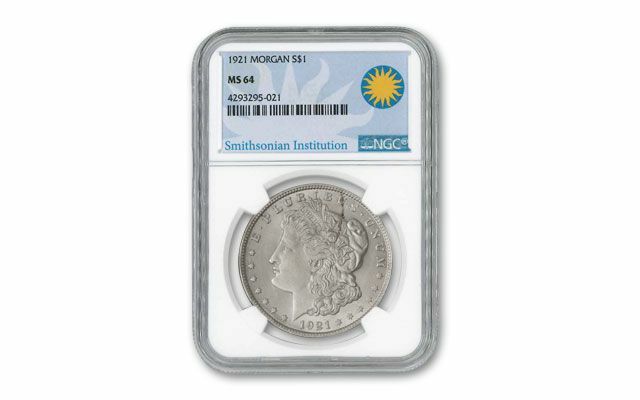 Since this type of Morgan is considered an American classic, we had acclaimed numismatic expert Jeff Garrett take a look through our discovery to hand-select the best for further inspection by Numismatic Guaranty Corporation (NGC) where their team of experts assigned each with a stellar grade of Mint State-64 (MS64). In addition, each of these 1921 Morgans comes sonically sealed in an acrylic holder by NGC along with a special Smithsonian Institution Coin Classic label! A portion of the proceeds from each coin will go directly to the Smithsonian Institution's numismatic department, helping to ensure the preservation of coins like these for future generations. These coins have stuck around for almost a century, but time isn't on your side to make one yours! Place one (or several) in your cart now!